Menu card from the Food Diplomacy event. The author plates her dish, “Malene’s Special Chicken,” at iLatina in Buenos Aires in 2013. 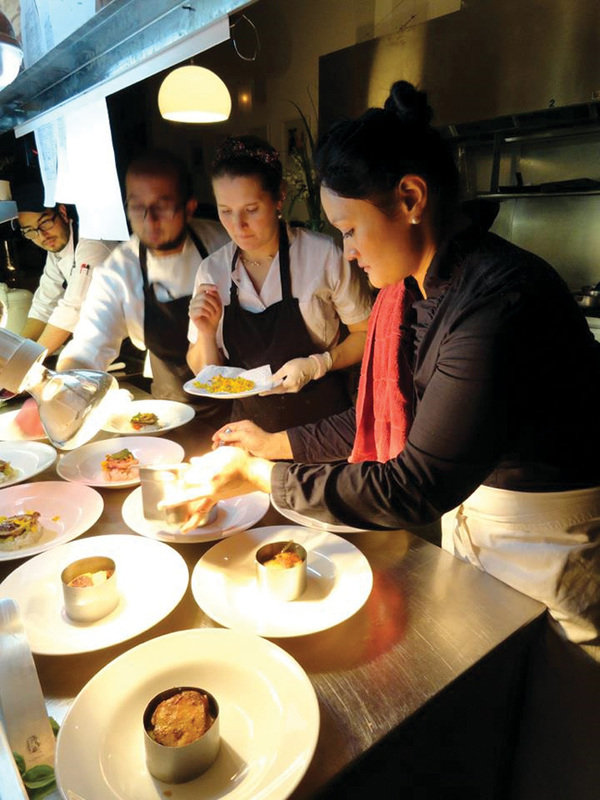 Shown, left to right: iLatina Chef Santiago Macias Acuña, Line Cook Miguel Valenzuela, Pastry Chef Vanessa Zorzoli and the author. The Foreign Service moves us every two to three years. The cities, languages and people may be new, but the familiar aromas wafting from a bubbling pot of Filipino adobo made from my mother’s recipe tell me I’m home. In 2006 in La Paz, one month into my first tour, I made my mom’s recipes for the Marine Security Guards. That evening I promised them that I’d cook for the “Devil Dogs” every month for the rest of my career. Preparing meals for Marines grew into a fullblown addiction to feeding others. I had no idea almost 13 years ago that sharing family recipes would lead to incredible international culinary adventures. One evening in Bolivia, I went out to a small restaurant that scrawled the day’s specials on a chalkboard. I worked up the nerve to ask the young chef inside if I could join his team. He must have had a wild side, as he agreed to let me, a stranger, in to play with knives. OK, maybe it was my offer to cook for free that made him amenable. “Yes, I just want to slice and dice to my heart’s content,” I replied. He knew I was a U.S. embassy employee, but no one else in the tiny restaurant did. I simmered in delicious anonymity. One kitchen was all it took to make me fall in love with the intense, creative, culinary environment. After that I cooked anywhere chefs would let me in and relished my delectable double life. I wore an American flag pin inside my coat collar as a secret reminder of my day job. We discussed American cuisine and jokingly threw flour at each other. They were curious about life away from the chaos, T-walls and daily explosions. For two tasty hours, I forgot I was in a war zone. My students promised to try the recipes at home, and pleaded for me to teach again. By the time we got back to the embassy gates, happy tears soaked my flour-covered PPE. Rolling gnocchi always brings me back to that magical day. Fast forward to post number four: Buenos Aires. By then I had happily slaved away in a few kitchens and stepped up my “chef de partie” game. I met Mun, a Korean-American chef, at an Asian American event, and subsequently dined at his “puertas cerradas,” a restaurant for guests with reservations only. I wanted to learn from this Wall Street executive-turned-executive chef, so I convinced him to take me under his wing. Mun does not cook—he creates edible stories. Mun was my greatest mentor, and at the end of challenging days in the office I sometimes let my mind wander to what my life might have been like had I taken his offer to cook full time. 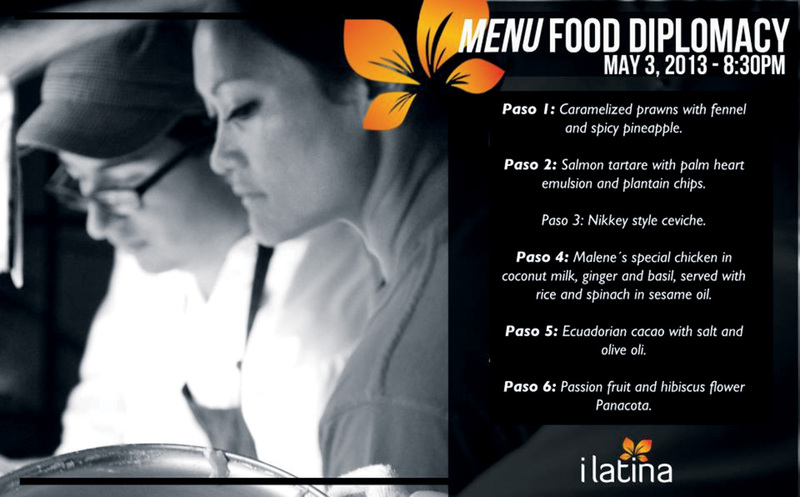 Next, I partnered with iLatina’s owner, Chef Santiago Macias Acuña (and siblings Laura and Camilo), who brought Colombian flavors to Buenos Aires with a unique and sophisticated twist. The handful of times I cooked alongside Chef Santiago were what foodie dreams are made of. I leapt at the chance to learn his recipes: smoked salt atop dark chocolate mousse drizzled with fruity olive oil, and patacones, fried plaintain slices topped with duck confit and homemade pickles for just enough acid to cut the fat. Chef Santiago and I offered a tasting menu for the diplomatic corps. Four chiefs of mission RSVP’ed, along with diplomats from more than 15 foreign missions. Chef Santiago asked me to put one of my dishes on the menu, and I exploded with pride serving a modern version of my mother’s recipes to my diplomatic friends. For the first time ever, my American flag pin was on full display in the kitchen, and it has been there ever since. Sassy British writer and food blogger Sorrel Mosely-Williams caught wind of my epicurean escapades and asked to interview me for the local English-language newspaper. I agreed, and there in a full-page back cover spread, I revealed my clandestine hobby: U.S. embassy employee by day, chef by night—like a crime-fighting superhero with an apron as my cape. The corner newspaper vendor beamed as he sold me 10 copies. He saw me almost every morning and, after reading the article, he probably finally understood why I always looked so sleepy. He knew my little secret, and so did all of Buenos Aires. Calls of congratulations came in from Argentine contacts and friends, while reservations at the restaurants I cooked in stacked up. Tucked amongst the sweet memories is one particularly bitter recollection. I once cooked for a well-established chef whom I both admired and hated, the way the world loathes and loves television chefs like Gordon Ramsay. During a slow dinner service, he stopped at my station to remind me that I was a “just a diplomat in chef’s clothing” and asked if I was having fun “playing dress-up.” It was a rude reminder but, I admit, very true. My hours spent in restaurant kitchens do not stack up to the time, energy and emotional roller coaster of being a full-time chef. Cooking is a brutal profession, with 16-hour days on your feet cleaning, prepping, labeling, cleaning, packing, unpacking, stocking, creating dishes, reinventing yourself—and did I say cleaning? The author filming an embassy cooking series in Buenos Aires in 2014. During her second tour, in Iraq, she taught English to Iraqi youth in the form of a cooking course. 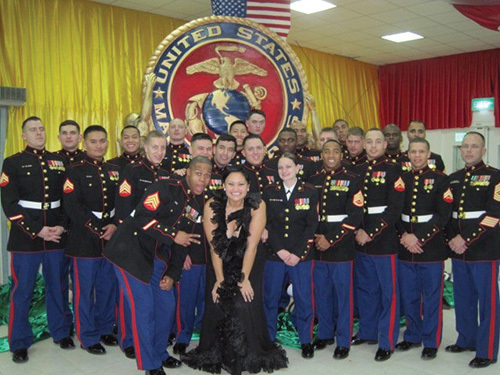 “My favorite tummies to cook for are Marines'!” says author Malene Carr, shown here with Marine Security Guard Detachment Baghdad in 2010. From Buenos Aires I moved on to South Africa, a food utopia where several cultures combine to create a truly unique culinary scene. My day job kept me busy, so I only cooked professionally in one restaurant every couple of months. In 2014, the Food Network debuted “Chopped South Africa” and my public affairs section colleagues asked me to represent our mission in the first mini-episode of the season. We split into 12 teams, each at its own kitchen station. Covered wicker baskets sat before each team. The challenge: make one dessert in 20 minutes using what was inside the basket plus pantry items. Three…two…one…Go! My partner, Melissa Ford, was the head of the public affairs section, and we were a powerhouse! We ripped the tea towel off the basket to reveal an odd mix of ingredients: fresh pears, chocolate-covered wafers, sweet-and-sour sauce and the kicker—a raw pork sausage roll. Time passed in a flash, with people yelling, cameras rolling, eggs cracking and flour spilling on every surface. Smoke and burned sugar smells billowed from the other stations. With one minute to spare, we plated three desserts: a caramel and pear crepe with crushed wafers, sweet and sour rice crispy treats, and thin, twice-fried, hard-candied sausage roll bites. With the remaining seconds, I carved pear garnishes (I had gotten a crash course in fruit carving from the Royal Thai Embassy). Melissa and I were ultimately named the episode’s champions. You couldn’t wipe the smile off my face for weeks. There are too many other mouthwatering moments to share in one article—filming a video in Afghanistan in Dari, a chef’s cookbook launch, pop-up events, cooking classes, bake-offs and more. My most prized possessions today are my memories with the gourmands who offered this wide-eyed girl sanctuary in a chef coat. Cooking is my way to cope each time I settle into new surroundings, helping me to thrive and connecting me to a like-bellied community. Chocolate lava cakes are my diplomatic weapon of choice. And I’ve lost count of how many friendships I’ve cemented over bacon and dumplings. Find your way to connect with others at post, whether through playing sports, rocking out with a band or bonding over a love of sci-fi. If you need inspiration, I suggest cooking your favorite recipe for a few Marines. Warning: High risk of amazing experiences ahead. 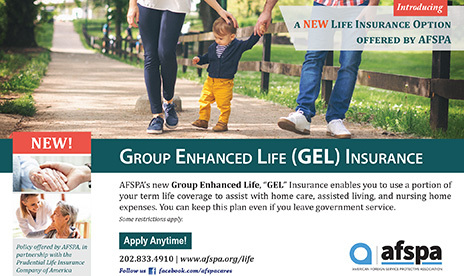 Malene Ginete Carr was born into a Filipino-American family in Germany while her father served in the U.S. Army. She’s a diehard University of Florida Gator and is busy most Saturdays during football season. She loves being a Foreign Service general services officer and is currently serving in Caracas. She is married to Mark Carr, a Foreign Service officer, and the pair enjoy traveling the world in search of the next epic culinary adventure.